New. 0135242339 BRAND NEW W/FAST SHIPPING! This item is: Modified Mastering A&P with Pearson eText--Standalone Access Card--for Human Anatomy, 9th Ed., 2020, by Marieb, Elaine N. ^Brady, Patricia M. ^Mallatt, Jon B.; FORMAT: Access Card Package; ISBN: 9780135242339. Choose Expedited for fastest shipping! Our 98%+ rating proves our commitment! We cannot ship to PO Boxes/APO address. To avoid ordering the wrong item, please check your item's ISBN number! New. 0135241715 BRAND NEW W/FAST SHIPPING! 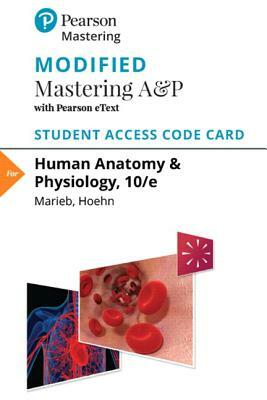 This item is: Modified Mastering A&P with Pearson eText--Standalone Access Card--for Anatomy & Physiology, 7th Ed., 2020, by Marieb, Elaine N. ^Hoehn, Katja; FORMAT: Access Card Package; ISBN: 9780135241714. Choose Expedited for fastest shipping! Our 98%+ rating proves our commitment! We cannot ship to PO Boxes/APO address. To avoid ordering the wrong item, please check your item's ISBN number!